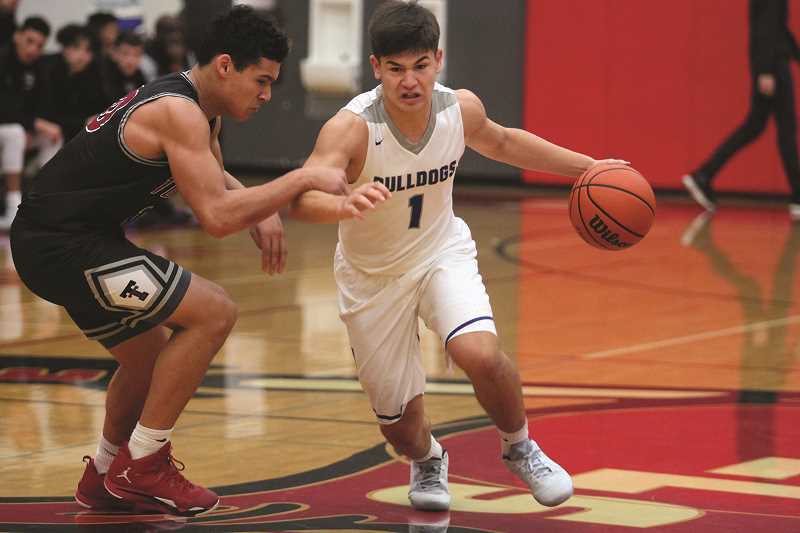 Coming into last week's South Albany Tournament, the Woodburn boys basketball team had just three games under its belt. The Bulldogs had split their first two games of the season, then had a massive 10-day break before their third game. It wasn't an ideal situation, but it may been exactly what the team needed to find out who they are and how well they mesh together. "Ordinarily as a coach you want to have more games, and that 10-day layoff was tough in ways, but it was good for us," Woodburn head coach Ryan Slider said. "Now, looking at it, I'm glad we got the extra time to practice." The Bulldogs are entering the season in a tough place in terms of experience. Woodburn graduated nine players from last year's team that went 12-12 overall, finishing sixth in the Mid-Willamette Conference before getting bounced in the play-in round. Just five players from that team are on this year's roster, and only two — junior Trevor Karsseboom and senior Ruben Alvarez — could boast any significant varsity playing experience. "We've definitely had some growing pains with the lack of varsity experience, which is fine," Slider said. "But we've really started coming together our last two games." 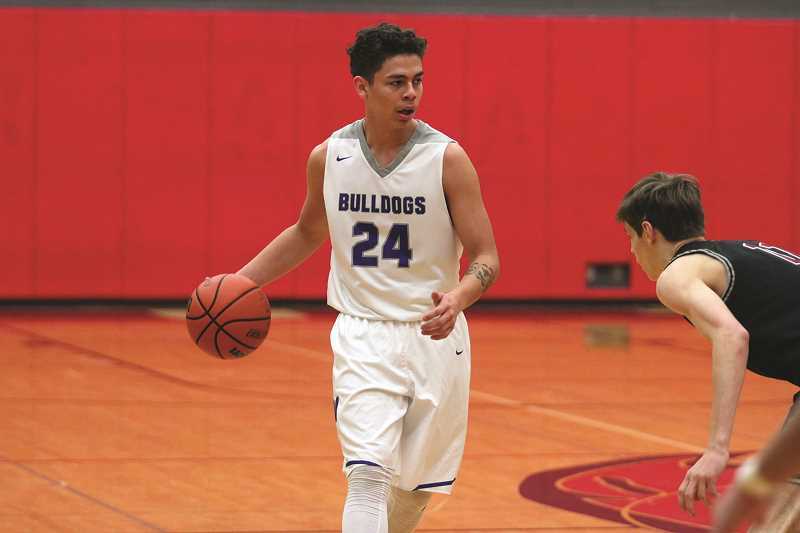 The Bulldogs split their first two games of the South Albany tournament, falling 99-56 on Dec. 20 to Tualatin — the No. 1 6A team in the state — before rebounding with a 67-60 win over North Eugene on Thursday to bump their record to 2-3 on the season. Despite the lopsided margin in the loss to Tualatin, the Bulldogs actually led for the majority of the first half against the Timberwolves. The next day, Woodburn was able to take the positives from that game and translate it into a win against the Highlanders to snap a three-game streak of losses. "We played well in the first half (against Tualatin), and we just didn't have enough firepower," Slider said. "But I liked what I saw, and we showed that last night against North Eugene and really played well as a team." Part of the difficult transition is not just working with kids who are making the leap from junior varsity to varsity, but introducing one who is new to the program altogether — senior guard Justice Ashpole, who transferred to the program from Putnam High School. Although he's new to the team, the Bulldogs have quickly welcomed Ashpole like an older brother. The 6-foot-3 guard boasts all-around game as a lead ball-handler who can slash to the basket and distribute the ball inside. But his greatest asset is his experience and leadership. "The guys respect him because he's also a very talented player," Slider said. "Great body, physical and aggressive, but his best quality is that he's a natural leader. He's the type of kid who talks a lot to the guys and explains things in a way they can understand. And they really vibe with him quickly." Ashpole gives the Bulldogs a much-needed second playmaker to slot in next to Karsseboom, who entered this season as the team's most experienced player. Karsseboom had a big weight on his shoulders, making the transition from the team's sixth-man and occasional starter to the team's primary scorer. With Ashpole sharing the load, the Bulldogs have another dynamic option on offense to punish teams who look to shut down Woodburn by focusing solely on Karsseboom. "I think we have two really marquee players in Trevor and Justice, and a very talented supporting cast," Slider said. "Justice is going to really help (Trevor) have a great year. It's really been a great complement for Trevor. It really takes a lot of weight off his shoulders." Woodburn was scheduled to finish the South Albany Tournament against Marist on Friday and moves on this week to play in the SCTC Holiday Classic hosted at Stayton High School. That will give the Bulldogs six games in a nine-day period to evaluate where they are as a team before moving on to the Mid-Willamette Conference in January. "Back-to-back tournaments has been great and will be great for those guys who need to get games experience-wise," Slider said. "Heading into what's arguably the toughest league in the state, these guys will be ready for it. Now that they've got some games under their belt and understand what it's about and what we want as a coaching staff, we have high expectations and the kids are starting to see that they can do some damage and be a scary team."